Watching the Olympic opening ceremonies in Rio, we pulled out one of our travel books, remembering our time in Brazil. 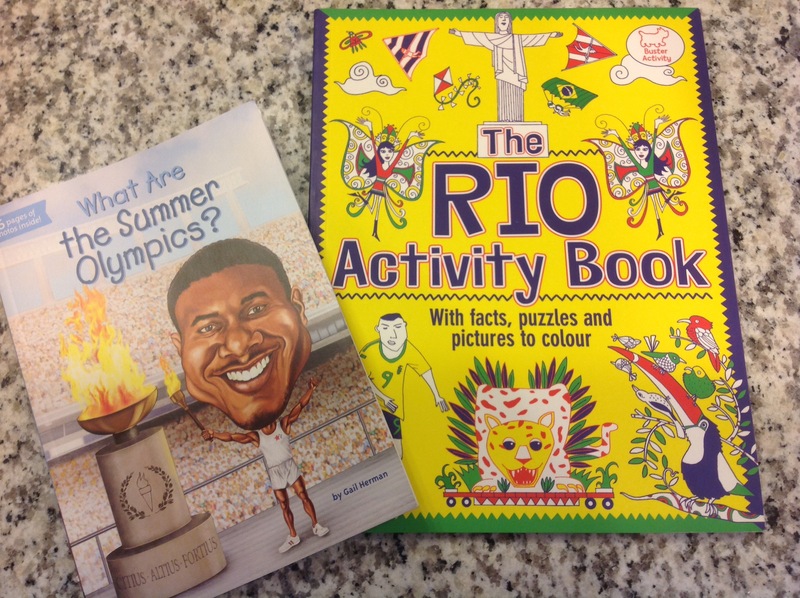 Of course, we also added a new book on the Olympics, and dressed in our Impanema thongs. In France, Greece, Chile, Argentina, Australia, California, Oregon, and South Africa we visited wineries, tasting rooms, and vineyards this year, so, when we saw that we were in Texas in time for the Grapevine Grapefest, we knew we could not miss it. Boy is an expert on grapes, now, and the event promised a free kids activity area. To avoid the 90+ F/ 35+ C temperature, we got there in the morning when the gates opened. We enjoyed the festival music and food, playing some games of skill to win a few prizes before trying any wine. The event featured areas spotlighting Oregon wines, Argentinian wines, and USA sparking wines from various regions. The main area, however, was the Texas producers. 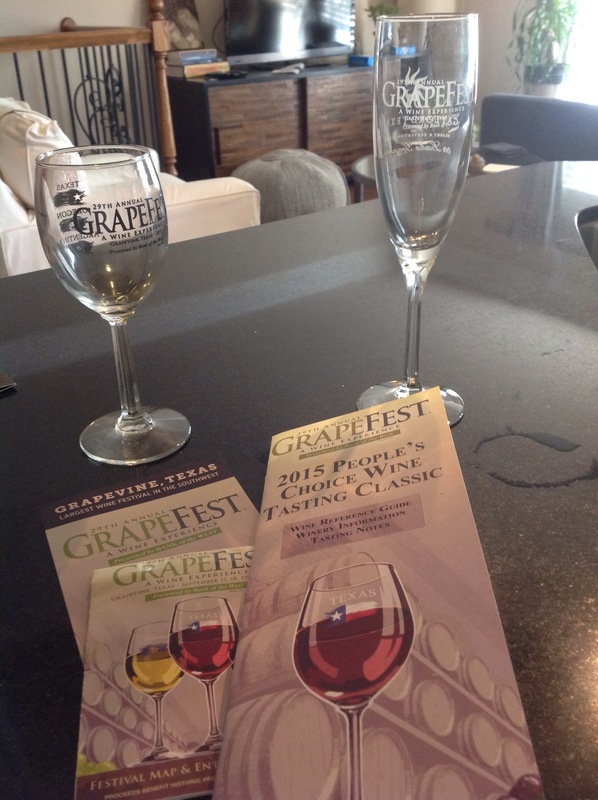 We wandered through the festival and sampled a variety of Texas wines. Many were very sweet, as Texas wines traditionally have been, but some winemakers have been experimenting with Spanish varietals to make a dryer wine. After our year of vineyard experiences, we decided Texas wines were not our favorite, but we still found a glass to enjoy with lunch. Our flight left Quito at a silly hour in the morning, but that meant we arrived in the Galápagos Islands by 9 AM. We decided to explore the islands from the land, rather than cruise ship, as this cut our costs significantly. So, our first stop was Santa Cruz island, one of the largest and home to the biggest town, Puerto Ayora. We started with a hike to the twin craters formed by the collapse of a magma chamber and followed this with a walk through a lava tube and a visit to a private ranch with a giant tortoise habitat, where we saw half a dozen of these incredible creatures. Our lodge was home to sea lions and marine iguanas, who came right onto the deck, and lots of birds. Sea kayaking was our next challenge, one we all enjoyed. Boy was less enthused about our snorkeling expedition, though he did like spotting a school of fish in the wild. Sharks he was less excited about. Boat travel was up next as we moved to Isabela island, the next largest where we hiked a volcano and did a bit more snorkeling. Back to Santa Cruz, we stopped at the Charles Darwin research center to see the baby tortoises at the breeding center. After two weeks in Cusco, Peru, we weren’t bothered at all by the altitude in Quito, Ecuador, despite its reputation as the highest capital city in the world. Our apartment, in the new town area, had view of the volcano from the living room window, really quite a sight. Boy was not certain he liked being this close to a live, volcano, no matter how dormant it seemed at the moment. It took some convincing before he was willing to stop watching for smoke plumes and go to bed. We decided to get up high to check it out in more detail and took the teleferiqo cable car to the very top of the volcano. There is an amusement park at the bottom, Vulquano Park, but Boy was not interested in spending a moment longer than he had to at that site. We spent the next day, a Saturday, at Parke la Carolina watching the locals paddle boat, play at the playground, and ride on a dirt bike track. After a rest, we went up high again to the Panecillo, another hill outside of town with a huge, silver statue of a winged Virgin Mary. In the Old Town, or Historic Center, we visited churches, each more impressive than the one before. The Compania church, was gilded, floor to ceiling, with Spanish conquistador gold. Old town was also where we found the Museo de la Ciudad, a surprisingly good museum, with life size reconstructions of different centuries in the history of the city of Quito. The Museo Nacional had a large collection of prehistoric and Incan artifacts, well presented, despite ongoing construction work on the building. The Numismatic museum, also called Banco Central, was another winner, the coin collection was impressive, there was a pleasant children’s area and great exhibit on the phasing out of Sucre and introduction of US dollar in 1999. Our final find was the Quito Observatory, centrally located, it had a nicely displayed collection of antique astronomical and seismographic equipment. We also took a day trip outside the city to the Mitad Del Mundo, the center of the world, also known as the EQUATOR! According the the GPS, the site is actually off about 250 meters, but this is where scientists measured the equator to be in the 18 th century. It was too expensive to move the tourist site after satellites were invented. We still had fun straddling the painted equator line to be in both hemispheres at once and testing our ability to balance an egg on its end. Overall, Quito was somewhat confusing. We found numerous things closed, unexpectedly, during posted open hours and days, though with two full weeks here, we had plenty of time to try again another day. School work this week included Spanish and LOTS of science. We had a stop at the Museo Interactivo de Ciencas, for some hands on experiments. We checked out the observatory, the equator, and the volcano and watched lots of science videos about volcanos and the layers of the earth’s crust. A few videos we borrowed were about Charles Darwin and evolution, to get ready for next week in the Galapagos. This was all thanks to our local library, from Kansas City, adding Bill Nye, National Geographic, and PBS videos to their online video streaming service. We LOVE the digital offerings of our library from back home! We walked the city, as we usually do, but this time, we thought we would keel over. The altitude in Cusco was a killer, and even a few stairs left us breathless. Thankfully, we planned a long stay here, so with nearly two weeks to use, we didn’t feel rushed. Our first few days, we took it VERY slow. Day 1, we managed to arrive and collapse into bed at the hotel. Day 2, was an improvement, we dressed and got out to a nearby restaurant to meet up with another traveling family. We had lunch and a great chat while the kids played in the plaza. Afterwards, it was back to bed to rest. By day 3, we were ready to see things, and took a quick side trip to Machu Picchu, returning to Cusco the next day. Then, we were finally ready to explore! From our apartment, it was a short walk to the main plaza, Plaza De Armas. The square is home to not one, but TWO large churches, built atop Incan buildings. Inside, each church tried to impress with more gold than the other. Nothing like the European churches we have seen, with stained glass and lots of light, these Spanish Colonial buildings are gilded, top to bottom with Incan gold collected by the conquistadores and melted down. Later, after our feet hurt from touring churches, we visited the Choco Museo, a museum of chocolate. The exhibits were fun, and the tasting exciting, but Boy begged for a chocolate class, so we signed up for a three hour cooking and history class, which took us through the different historical recipes for chocolate from the ancient Mayans through the conquistadores, to modern candy. None of us were hungry for dinner after that day! After that class, schoolwork seemed less exciting, but we continued with our Incan and conquistador studies, supplemented by field trips to the Spanish church, built atop the Incan palace at Quoriconcha, the Museo Inka, the Museo de Arte Precolumbio, the Incan ruins of Moray Moras, and Sacsaywayman. Boy even did a compare and contrast exercise of the conquistadores Pizarro and Cortes. We worked in some fun as well. A day trip out to Piscac gave us the chance to see more Incan ruins, before we met back up with the traveling family from Cusco for lunch and a swim. The kids had a great time. Our final day in Cusco happened to be Dads birthday, a big number, and he wanted a challenge, so after fortifying ourselves with American style burgers and milkshakes at a local restaurant, he was ready to do some mountain climbing. It felt like mountain climbing, anyhow, as we walked the steps through the neighborhoods, up to the top of the hill above the city, where the statue of Cristo Blanco overlooks the city. We rested on a bench at his feet for a long time, before taking a taxi back to the apartment. From here, we leave Peru and head to Ecuador. Despite being on top of a mountain, the ruins of Machu Picchu are actually lower in elevation than the city of Cusco. You descend into the Sacred Valley of the Inca, from the higher city of Cusco. We arrived during the rainy season, in February, when the train tracks are under repair and heavy rains lead to mudslides. This meant we were not able to take the train, all the way from Cusco to Machu Picchu. Our first leg, about half the journey, was by bus. We transferred to the train only after getting through the steepest of the mountain passes. In this month, also, the Inca trail, a walking path through the mountains to the ruins, is closed, reopening in March. 4 days of hiking mountain trails was beyond us, so we were not too disapointed to take the bus/train option. The train ends at Aguas Calientes, a town at the base of the Machu Picchu mountain. From there another, local,bus takes you up a narrow, windy road to the ruins. Boy found the twisty mountain road a bit rough, and was more than happy to stop moving when we reached the top. We got in a bit of astronomy studies, too. The hotel at the ruins, is high on a mountain with little atmosphere and little light pollution. When it got dark, they set up a telescope and we had a chance to view Jupiter, the moon, and several galaxy clusters before the cloud cover moved in. Boy loved his first telescope experience. Resting overnight, we hit the ruins at dawn. The rainy season limited the crowds, so we had a few times in the morning where we were alone in the maze of buildings. Despite his protests about visiting yet, another, old thing, Boy was inspired to take photos. He took so many that he ran out the camera battery TWICE. After Boy ran out the camera battery the second time, we talk the bus back down to Aguas Calientes to board the train back to Cusco. The train and bus took us back up to the higher elevation, and back to the city.